Because of their tapestry-like nature, the films of Luis Buñuel lend themselves well to a more in-depth form analysis. Within their aesthetic ploys and their narrative spines lies a wealth of readings concerning Buñuel’s attacks and treatises on politics and class especially. His 1972, Oscar-winning film, The Discreet Charm Of The Bourgeoisie is a perfect example of how a fragmenting narrative falls into dreamscapes that tell of more than the purely surrealist shock tactics of his earlier work with Salvador Dali. From its title alone, the obvious target is the bourgeoisie, the middle-class idolaters whose power is often sociologically abused for their own ends at the expense of others. Yet, for a film full of incredibly stark images, there is one ploy of Buñuel’s which stands out from his other political attacks and this bares some weight on the overall success of the film. Discreet is punctuated, whether through its dreams or its reality (or perhaps even both), by a recurring motif of the six main characters walking endlessly along a country road. It is in this contrast of geography and in action where Discreet‘s most subtle political comments are formed. The scenario in question often marks the end of a scene or, occasionally, a dream sequence. The film takes pleasure in losing the viewer within a cascade of dreams and even dreams within dreams, but the “coming up for air”, so to speak, is this stark, perambulatory scene. The three males and the three females are walking in a seeming rush along the roadway. There is no traffic and the surroundings are overtly rural; it could be the road where the pair of unfortunate cyclists from And Soon The Darkness (1970) meet their fate. Both films make the most of the topographical eeriness of such a space. But there is more to this visual aesthetically than its simplistic description suggests. The pace of the walkers demonstrates a potential destination for the sextet, their determinedness becoming more apparent as the film progresses. Yet the group does not progress; in fact, it appears that they revert back to similar positions earlier on in the road belying an ominous and endless journey. The editing also give an oneric character to these moments, with each cut moving the arrangement of the six people into different places. In one cut, the couples of the group can be seen walking together but, in a second cut, the people can be dispersed, again functioning in the fashion of a dream. Perhaps the image also feels more surreal than it actually is because of its unexplained placement in the film. Even in the dream sequences, the most surreal of moments are concluded with a character waking up, highlighting that all before it was a dream. These segments provide or contain no such clarity, instead popping up as if taken from an entirely different narrative altogether. 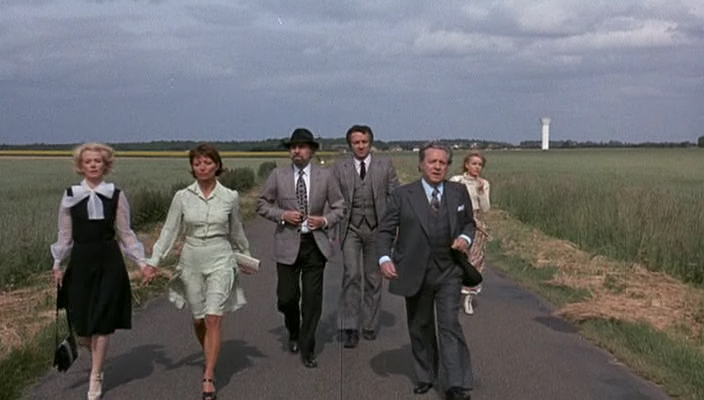 Added to this is the clothing of the group which is clearly more fitting for the various social and bourgeois occasions that the film is built around; the smart suits and dresses more fitting for the constant barrage of dinner parties rather than the terrain of rural country lanes. 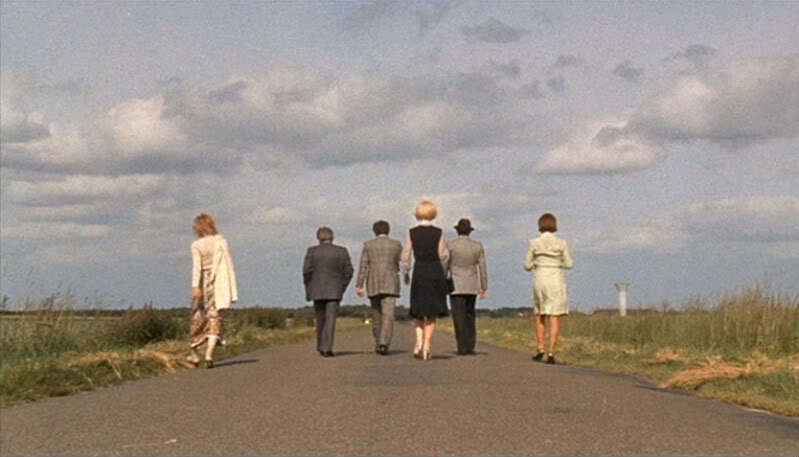 Buñuel has been on record for initially wanting the characters of the segment to be shown to be growing more and more weary as the film progresses, later dropping it in fear that it would be too obviously symbolic. The scenario does still retain its sense of symbolism, it is after all disconnected from the any semblance of the main narrative, but what symbolism can this be? 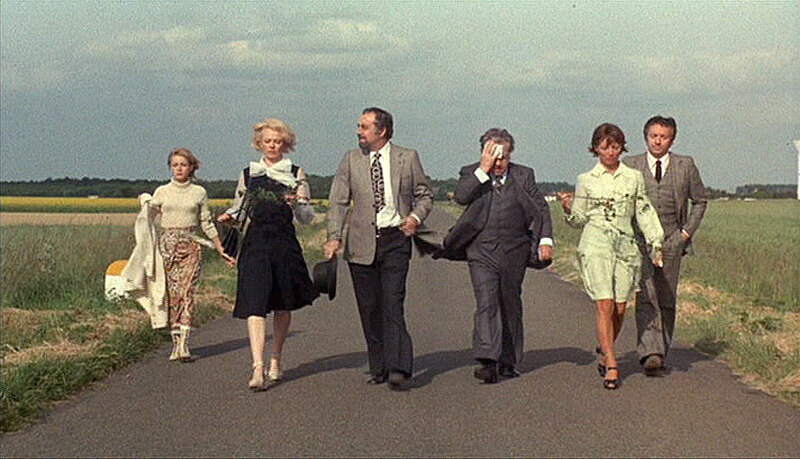 Throughout, Buñuel has connected the bourgeoisie to a very strict, urban or suburban dwelling. They have blended in to their lavish backdrops of opulent houses and offices, a social camouflage hiding their often immoral purposes such as drugs smuggling or adulterous activities with each other. In the flat landscape of the rural zone, the characters have nowhere to hide, no camouflage to suit the vegetation. Therefore, they are forced to do the only thing possible for an animal under surveillance and out in the open: that is to keep moving. The landscape highlights their dreariness, effectively removing the Wizard of Oz’s curtain, and shows them to be dangerous in their ordinariness; their true colours are far more obvious when in contrast to a backdrop in which they cannot disappear under tables or into bedrooms. Many people nowadays live in a series of interiors disconnected from each other. On foot everything stays connected, for while walking one occupies the spaces between those interiors in the same way one occupies those interiors. One lives in the whole world rather than in interiors built up against it. Nice post and well-said Adam! The nowhere road are among the most memorable scenes of the Discreet Charm Of The Bourgeoisie. I feel these scenes make a strong connection between me and whole surreal characters/stories of the movie. Actually, I am looking to find a good poster of it, I wanna hang it and have it in front my eyes, probably it will remind me how lost we are! Wanders: Alan Garner’s Edge And Cadellin’s Home.